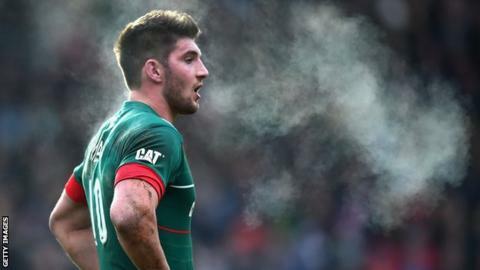 Leicester Tigers fly-half Owen Williams will miss the rest of the season after surgery on a knee ligament injury. The 23-year-old former Wales Under-20 international was injured in the Anglo-Welsh Cup win at Cardiff on 6 February. Williams, who spurned interest from his home nation to at Welford Road last month, has 104 points from 13 Premiership games this season. "It's massively disappointing because he has been outstanding for us," said director of rugby Richard Cockerill. "He is a young man with a big future in the game and we look forward to his return when he is fully recovered. He is in good hands with our medical team and he will start his rehab shortly. "The full recovery period is usually about nine months." Scarlets wanted Williams to return to them prior to him agreeing a new deal with Leicester. And Wales coach Warren Gatland subsequently named Dan Biggar, Rhys Priestland, and Garath Anscombe as the three number 10s in his Six Nations squad. "I would have thought out of three 10s he would at least get the opportunity to go and train with Wales and put his best foot forward," Tigers director of rugby Richard Cockerill said last month.